Shaken but not stirred, I spotted this fascinating diagram yesterday. 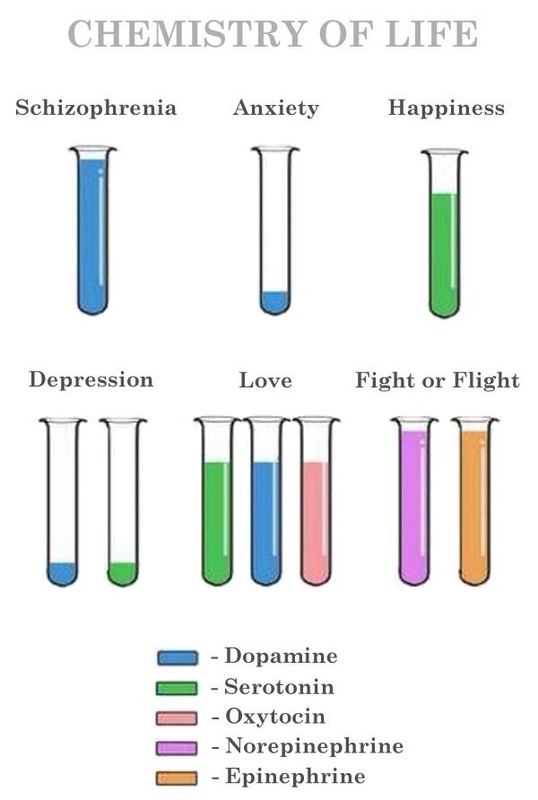 It describes moods, mental states and conditions in test tube form. So which comes first – the chemical state or the state of mind? Are we in love or just hydrogen bonded. Are we low or just low on the right hormones. It’s complex chemistry – but it is chemistry. The brain is a wet sugary computer – but that I think is why it’s so different from silicon chips and solid state physics. Hormones diffuse and dissipate they don’t switch on and off. Computers are yes/no. Brains are a constantly changing cocktail of ‘maybe’.